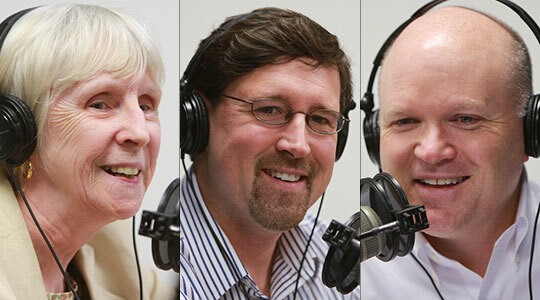 Summary of today’s show: Scot Landry, Susan Abbott, and Gregory Tracy discussed the news headlines of the week, including the final proposal of the Archdiocesan Pastoral Planning Commission to Cardinal Seán; CatholicTV’s new show “Aging Gracefully”; The lack of realization among Catholics that assisted suicide is on the ballot in November; How Marian devotion got downplayed at Vatican II; and the dedication of a Liberty Flagpole at one parish. 1st segment: Scot Landry and Susan Abbott talked about busy everyone at the Pastoral Center is with the end of summer. Susan noted that the start of religious education programs on Catechetical Sunday this Sunday is keeping her office busy. Susan said today at Mass she heard St. John Chrysostom’s phrase “invincible patience” and that’s been on her mind all day. Scot asked Gregory Tracy about the front page story in the Pilot which is about the final proposal to Cardinal Sean from the Archdiocesan Pastoral Planning Commission. Scot said it was delivered to Cardinal Sean a couple of weeks ago. Scot said the Cardinal is now reviewing it and consulting with other bodies before making a final decision. So far, he’s met with the Presbyteral Council, which unanimously recommended he accept the proposal. Last week, Scot said the Cardinal’s cabinet also unanimously recommended it as well. The final decision is expected in mid to late December. Susan said she was pleased to see in the article in the Pilot that all along that this was emphasized as a proposal. Many people thought this was a rubber stamp process and a done deal. Scot said part of that is because this is the third or fourth attempt by a group to come up with a recommendation. But for this process the participation of everyone was taken. Susan said some of the original elements of this proposal were modified after feedback from the consultations throughout the archdiocese. Scot noted that the consultation over the last 10 months included 40 archdiocesan meetings with 5,000 people as well as 200 independent parish meetings representing 20,000 people. They received more than 8,000 single-spaced pages of feedback. They consulted 16 times with the Presbyteral council and the Commission itself met 31 times. Fr. Paul Soper, the interim pastoral planning director, said this is an historic consultation. Greg concurred that he’d never seen or heard of such an extensive consultation with as much give and take and feedback. He added that it is clear that changes were made based on the feedback, including the biggest item concerning how pastors for the proposed collaboratives would be chosen as well as phasing in the changes versus making a massive change in a short time. He noted that there will be an initial voluntary first phase. Scot said the proposal is available for anyone to read on the link above. He said it’s a thorough document and anyone who cares about the Church should read it. He noted that it is also written very clearly. Susan said that damage is done when people argue based on what they’ve heard, rather than reading the primary sources first. She encouraged everyone to read it with an open mind. Greg agreed and said he’s heard people talking and sharing information that was incorrect and he attempted to correct them. He said that’s one of the reasons why they wrote a story that was so long. Scot said tomorrow’s show will be dedicated to looking at the proposal in depth. He provided a summary. The first part of the document is focused on strengthening parishes and the second is on strengthening parishes for the work of the New Evangelization. He listed some of the highlights, including the 288 parishes of the Archdiocese will be grouped in approximately 135 Parish Collaboratives, usually consisting of two or three parishes. They will be phased in over a period of five years. The collaboratives will be assigned one single Pastor. Scot noted that most pastors have said this is where the archdiocese needs to go, but they need training on how to accomplish the goals of the pastoral plan. Each collaborative will be asked to come up with a local pastoral plan within 12 months of implementation of the collaborative. The recommendation also includes pastoral training for priests and lay pastoral staff by the Office of the Episcopal Vicar for the New Evangelization, the Catholic Leadership Institute, and the Office of Pastoral Planning. There are also separate recommendations from the Religious Education Task Force and the Committee to Study Lay Formation Programs which the APPC recommends be implemented in their entirety. Greg said this is a monumental undertaking. The focus of the discussions he’s heard so far has focused on administration and organization, but the training is really worth noting. He was taken aback by the massive undertaking of all the training that they plan. If it all comes to fruition, we will have one of the best formed dioceses in the US. He thinks a lot of the controversies we see, it comes from confusion about what the Catholic faith is, and this training plan helps deal with that lack of understanding. Scot said Cardinal Sean is serious that this plan is about the New Evangelization and giving significant training so we can be effective at evangelization. Susan said certification of catechists comes through the Archdiocese and her office, and this planning process has given them the impetus to get everything properly set up and improve how they standardize and certify everyone. 2nd segment: Scot said “Aging Gracefully” is a new series on CatholicTV, and the host is Fr. Michael Sheehan, SJ,the provincial of the local Jesuit province who also happens to be a medical doctor. Greg said while the show never says they’re motivated by the assisted suicide debate, they do say that this is a moment to talk about the elderly and how they can live their life well. Also in the Pilot this week is a story about St. Augustine Parish in Andover dedicated a Liberty Flagpole in honor of September 11. They dedicated the pole a day earlier so that those they invited would also be able to attend 9/11 celebrations. It was prompted by a parishioner asking why there wasn’t a flagpole in the sanctuary. Greg said there are no regulations concerning the practice, but it began during World War II. Later on the US Bishops recommended that symbols apart from the worship of Christ should be outside the sanctuary. Fr. Peter Gori, the pastor, explained all this in his bulletin, and then said tongue-in-cheek that if anyone wanted to dedicate a flagpole to the church, he would welcome it. One parishioner immediately donated the flagpole and another couple donated the flags. Fr. Gori said it honors every citizen who has strived to be both a good American and a good Catholic. The flagpole was dedicated to the men and women of St. Augustine Parish who served in the U.S. Armed Forces throughout the years. “My greatest passion has always been to serve God and my country,” [Claude] Gallant [the donor of the flags] said. In The Anchor this week was a story about the efforts to oppose Question 2 on the ballot in November about the legalization of assisted suicide. There was discussion that an issue like this should be debated in public in the Legislature so that the voters can be informed and heard before a vote. A ballot question avoids all that and many of the people the Anchor talked to were shocked to learn that this is on the ballot. Scot said if people like the listeners of TGCL or who go to church on a regular basis or read The Pilot and The Anchor don’t take up the baton and engage others on Question Two, then we face an uphill battle to oppose it. Greg said those of us who work in the Church and especially in the media, we can think we’re overdoing coverage of this issue, but he knows that you have to keep hammering it home because you never know which article someone will pick up and get informed. Scot said it’s important to know that arguments put forward by the broad-based coalition opposing the ballot initiative are not faith-based arguments, of which there are plenty. There are also arguments that are very practical and can be apprehended by anyone, whatever their faith background. Susan noted that there will be a series of workshops taking place throughout the Archdiocese that start next week. The list of workshops is available online. Scot said yesterday’s show was a great discussion with Dr. Ken Stevens, an oncologist from Oregon where assisted suicide has been the law for more than a decade. He said DR. Stevens brought up a great point that a state can’t on the one hand say assisted suicide is okay, while also saying that other kinds of suicide is bad. Scot said tonight, Cardinal Seán will be on EWTN’s The World Over with Raymond Arroyo at 8pm. It can be heard on WQOM or on TV. Also, on October 3 at 8pm, Cardinal Sean will be hosting a live virtual town hall on CatholicTV, simulcast on WQOM, at 8pm. Starting that evening, Cardinal Seán is asking all Catholic families to pray a daily rosary to defeat this ballot question. The Cardinal has recorded special episodes of the Rosary to air on CatholicTV for this purpose. This will air five or six times per day until November 6. He wins A CD from the Envoy Institute: “An Antidote to Atheism” by Msgr. Stuart Swetland, and the booklet “Catholics in the Public Square” by Bishop Thomas J. Olmsted of Phoenix. 4th segment: Scot noted that there was a big conference at the Vatican on Marian devotion. Fr. James Phalan of the Mariological Society told the academic conference that a misreading of Vatican II led to a collapse in Marian devotion. He said people interpreted some of the debates on where to include devotion to Mary in the documents as being a downgrading of devotion. He also said that was connected to a collapse in devotion to the Holy Spirit. He described it as overly rational. At the same time, Pope Benedict XVI during an audience remembered that debate over where to include a document on Mary. There wassome talk about having a separate document, but they ultimately decided to include it as part of Lumen Gentium. The Holy Father said there were good reasons to make this part of the Constitution on the Church (Lumen Gentium). He then reflected on how popular piety is nourished by biblical and patristic references.